Whatever Micheál Martin is accusing Gerry Adams and the Republican movement of, it seems he is equally guilty. Leave aside the utterly despicable tactic of using a child abuse conviction and sentence against Adams’ brother for political gain. This after all is Fianna Fail, a party with nothing but contempt for the plain people of Ireland, including the victims of sexual abuse. Martin’s utterances are very carefully-worded, but no less damning for that. He claims to have information that “Republicans” have covered up cases of child abuse. And if he – the leader of a party that still inexplicably calls itself “Republican” – had that information and didn’t act on it, then he is guilty of whatever it is he is accusing the Republican movement (by which he means Sinn Fein, and not his party, which ruined the country) of. This may have been a broader trend within the Republican movement. Fianna Fáil calls itself “the Republican Party” – is it also to be considered a party of paedophiles, thanks to this crude smear by its own leader? Maybe so – because if Martin had evidence of a cover-up of child abuse, should he not have talked to the Gardai, rather than the Fianna Fail press office? This is where his story begins to come apart. After all, Fianna Fail supported the children’s referendum, the passing of which will lead to the rights of children being written into the Irish constitution. One of the expected pieces of legislation is to make the reporting of child abuse mandatory – something which Martin, despite claiming to have evidence – hasn’t done. So why hasn’t Martin reported this cover-up? There are many possible reasons, but the most likely is that there is no cover-up. Martin has no evidence of a cover-up of child abuse by Republicans because there isn’t any – this “cover-up” is a hasty and ill-thought-out political construct executed to stop the haemorrhaging of voters from Fianna Fail to Sinn Fein. The problem for Fianna Fail is that fewer and fewer voters remember when Sinn Fein were inextricably linked to terrorism, and nor can they remember when Fianna Fail were actually Republicans. What they do remember is the fact that a succession of Fianna Fail spivs destroyed the country and surrendered its economic sovreignty, before being destroyed in a general election which many of their sitting TDs didn’t even bother to contest, such was the guarantee of humiliation. They have slowly been allowed to rehabilitate themselves, mostly thanks to the fact that the Labour party have taken over their mantle of the party that changes its policies with the winds, and will say and do anything to cling to power. But the big thorn in their side – and indeed that of everyone else – is Sinn Fein. Disaffected voters, sickened by the hardship foisted on children, the sick and the elderly by a succession of austerity budgets initiated by Fianna Fail, are flocking in their droves to them. Abandoned by the Labour Party and ignored by the rest, Sinn Fein is the only party that they feel speaks for them. 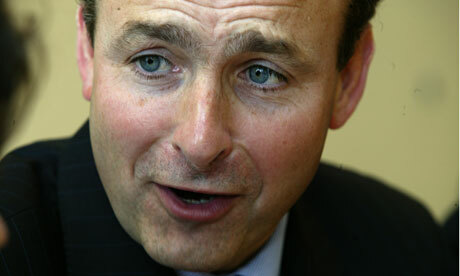 Are Fianna Fail worried? You bet they are, and at every turn, the established parties seek to drag up the past. Jean McConville´s name is regularly shouted across the Dail chamber, always out of context, always by someone out of ideas. I am no fan of Gerry Adams. His ridiculous insistence that he has never been a member of the IRA is as laughable as it is counter-productive. He has been party to despicable acts and he hasn´t always told the truth about them. And if senior Republicans like Brendan Hughes – a man whose searing honesty about his own involvement in violence has taught us more than many would care to know about both the armed struggle and Northern Ireland in general – says Adams was a leading figure in the IRA, then I believe him. But like him or not, Adams has taken political and personal risks to deliver a sort of peace in Ireland. Micheal Martin, on the other hand, has played an integral part in the destruction of the Irish health service, and eventually the country itself. He has never shown remorse, never apologised properly for his part in destroying the future of generations of Irish children to come. And now he has either sat on his hands despite being aware of a child abuse cover-up, or he has fabricated the whole thing to exploit the pain of the family of a political opponent for personal gain. Neither of those is the behaviour of a statesman. But both are unfortunately par for the course for a Fianna Fail politician. Micheal Martin, like his party, is a stain on the Irish republic, and needs to be dispensed with if Ireland is ever to recover a semblance of what passes for democracy. 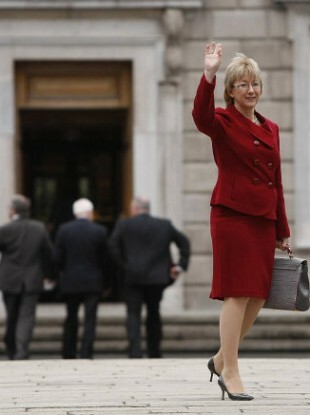 Mary Hanafin waves goodbye to Leinster House. There is, as we say, a narrative. It’s not hard to work out. Sure, Fianna Fáil were to blame- but the blame was not theirs alone. It was Lehmann’s, and the Greeks, and the banks, and anyone else you care to mention. We all partied- remember that? Mary Hanafin went on Marian Finucane’s show this morning and gave what can only be described as a a car crash of an interview. It was filled with the kind of arrogance and ignorance that – in a functioning democracy – should ensure the death of Fianna Fáil and all they stand for. She is not alone in adopting this narcissistic narrative; ever since the departure of Brian “Tweedle Dumbest” Cowen, the story has been the same, led by the cringeworthy videos of Mícheál Martin strolling around his native Cork, oblivious to the misery he had wrought upon it. It’s worth pointing out to Mary and the rest that it was nothing to do with the banks, or Lehmann’s, or the Greeks- the blame for the country’s economic destitution lies wholly and solely with Fianna Fáil. As the biggest party in government during the boom, they had responsibility to manage it. They failed utterly. The Greeks don’t blame the Americans, or the banks, or Lehmann brothers. They know they massaged the figures to get into the euro – if any bank bears any responsibility, it is Goldman Sachs, who dealt the cards for the three-card trick that fooled the rest of the world into thinking they were solvent. But Mary does. What she doesn’t do is explain what the Americans or Lehmann’s had to do with runaway lending, an unrestrained construction industry, rampant rises in public spending and reckless endangerment of the country’s finances. When asked a hypothetical question about whether the big Don, Bertie Aherne, should be thrown out of the party should Mahon find that he acted inappropriately, she held the party line- “let’s wait for that decision”. Even on the deck of the Titanic, she cannot bring herself to point out the iceberg. It is, of course, the party line, and as Labour’s quislings have shown since their rise to power and subsequent similar betrayal of the Irish working class, the party comes before everything. Psychopaths are usually defined by a number of characteristics, often to do with amorality and criminality. Key among them are an absence of remorse or empathy – given their inability to apologise to the people of this country for destroying it, it is not unreasonable to suggest that Fianna Fáil is a psychopathic party. They destroyed the country. And they in turn should be destroyed. They should never darken the door of Dáil Eireann again. Towards the end, Hanafin even had the gall to suggest that she is not done with politics. I hope to god the Irish people will show her that politics is done with her. Let that be our new beginning.